MERISSA Aguilleira is anticipating her new role as manager/motivator of the TECU Southern Titans in the second edition of the Courts T20 Grand Slam Tournament, as injury has forced the wicketkeeper to miss the tournament. Aguilleira was expected to captain the Titans in their opening match against LCB Contractors Central Sharks at the Wilson Road Recreation Ground in Penal, from 7 pm tomorrow. Aguilleira is suffering from shin splints, which has been affecting her since the regional women’s tournament concluded a few weeks ago. 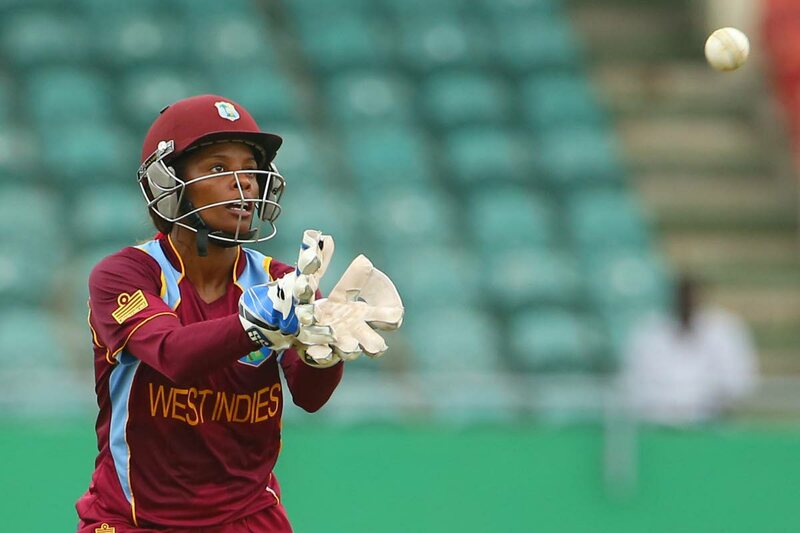 Aguilleira was advised to stay out of the T20 Grand Slam because the West Indies women will play Sri Lanka in a series coming up, before playing in the Women’s World T20 Tournament in the Caribbean in November. Despite her absence, Aguilleira believes her team will be competitive. “I think we have a really good chance of winning the competition. I know it is going to be a difficult one, because if you look at the other teams there are some really good teams, but I think it is all about going out there and making sure you execute well,” she said. The Titans will count on the regional trio of Deandra Dottin (Barbados), Shakera Selman (Barbados) and Sheneta Grimmond (Guyana). The TT pair of Britney Cooper and Shenelle Lord will bring some added experience to the team. Twelve regional players will feature this year among the four teams – an increase from eight last year. Browne, on the public’s interest in the tournament, said, “People are very much interested. Already there is a lot of hype starting on Facebook where we a trying to do a lot of advertisements for the tournament. We are expecting the fans to come out and we are hoping the fans will come out in their numbers.” The fourth-placed team will be eliminated from the tournament after the preliminary phase, and the teams finishing second and third will play in a playoff match. Teams will be eager to finish on top after the preliminary phase as the top team will advance straight to the final on July 28. In the other match tomorrow, Trident Sports Phoenix will play Udecott North Starblazers at the National Cricket Centre (NCC) in Couva. Tomorrow – Trident Sports Phoenix vs Udecott North Starblazers, NCC; TECU Southern Titans vs LCB Contractors Central Sharks, Clarke Rd. Thursday – Trident Sports Phoenix vs TECU Southern Titans, Brian Lara Cricket Academy (BLCA); LCB Contractors Central Sharks vs Udecott North Starblazers, NCC. Saturday – LCB Contractors Central Sharks vs Trident Sports Phoenix, NCC; Udecott North Starblazers vs TECU Southern Titans, BLCA. Sunday – Udecott North Starblazers vs Trident Sports Phoenix, BLCA; LCB Contractors Central Sharks vs TECU Southern Titans, NCC. July 24 – TECU Southern Titans vs Trident Sports Phoenix, NCC; Udecott North Starblazers vs LCB Contractors Central Sharks, BLCA. July 25 – Trident Sports Phoenix vs LCB Contractors Central Sharks, BLCA; TECU Southern Titans vs Udecott North Starblazers, NCC. July 27 – Semifinal - 2nd place vs 3rd place, BLCA. July 28 – Final - 1st place vs Semifinal winner, BLCA. Reply to "Aguilleira to miss Courts T20 Grand Slam"